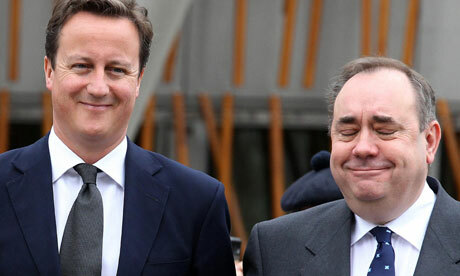 politicalbetting.com » Blog Archive » Will Westminster stage the Independence referendum before Alex does? Will Westminster stage the Independence referendum before Alex does? The Sunday Times are running a story that, if Alex Salmond doesn’t agree to a single question referendum, then Westminster will organise theÂ referendum for next year, and not devolve the necessary section 30 order allowing Holyrood to organise a legal referendum. SNP plans to hold a referendum plans without the necessary order, would leave the result open to years of legal challenges, something that SNP strategists acknowledge as very problematic, that needs to be avoided. The Conservative, Labour and Liberal Democrat parties at Westminster are coalescing around the position, that one constituent part of the Union can’t change the terms of the Union without the consent of the other parts of the Union.Â The Devo Max option would change the terms of the Union, and leave the other parts of the Union at a disadvantage. Because there is just one Tory MP in Scotland, Scottish Labour MPs will initiate the move, and the coalition will support this. Some Scottish Labour MPs support such an approach, citing polling evidence which suggests Scottish voters do not care which parliament holds the referendum. Senior government sources have confirmed there is space in Westminsterâ€™s legislative programme to enable an independence referendum next year. A spokesman for Salmond said the threat of a Westminster referendum smacked of â€œmore sabre-rattling from the Tory-led anti-independence campaignâ€. Is this mere sabre-rattling, or should we expect a referendum next year, will SNP supporters welcome the opportunity to vote on leaving the Union next year?